Last week I was struck with the sudden urge to improve the shipping department at Money in the Garage studios. In a nutshell, I use the same table when photographing merchandise and wrapping packages to ship. This can be a real pain, particularly when I have to constantly clear the table of shipping tape and packing material in order to photograph items. Deciding it was time to get more efficient, I searched Craigslist for a table I could use exclusively for wrapping packages. Within minutes, I found a sturdy looking table that could fit the bill. But being a seasoned Craigslist seller myself, I had to chuckle at the listing's lame photograph. 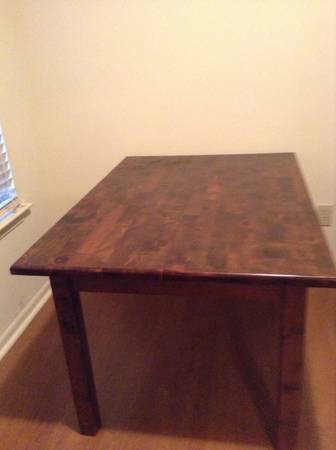 It looked like the seller had put zero effort in photographing the table. In fact, the photo had all the charm of a police mug shot. But despite the ugly photo, the table looked like it would suit my needs for a wrapping table. The seller wanted $35 for the table and four mismatched chairs. I e-mailed her, saying I was interested in the table only. After exchanging a few more e-mails, I headed to the seller's house to check it out. It was dark out when I arrived at the young couple's house. The husband met me at the front door and I followed him into their second floor condo. As I reached the top of the steps, I was greeted by a funny little kid who seemed to be very entertained by my sudden presence in his home. The little guy asked me who I was? For laughs, I shrugged my shoulders and apologized for not being Santa Claus. As the kid continued to grin at me, I assured him that the big guy would actually be at his house in five months! While the youngster continued to badger his mom about me, I began looking over the table. The seller explained that her father had built the table by hand. Shaking the table, I could tell her father did a quality job. There was very little shaking and looseness you sometimes find with old tables. Although I appreciated her father's labor of love, I explained that I was only looking for a table to wrap packages on. This was my way of telling her I wasn't going to spend much money for something destined to be a work table. After a little more shaking and tapping of wood, I offered $20 for the table. Before the young mom could offer a reply her hubby jumped in saying, "We'll take it." A few minutes later the old table was in the back of my truck and heading home with me. Stoked about my new wrapping table, I couldn't wait to get it downstairs to the basement. Sonny boy and I each grabbed an end and headed to the stairs. But despite my useful directions, ordering Sonny boy to lift here and push there, we quickly ran into a slight problem. The table was too big for the basement stairwell! Adding to the dilemma, the crafty father who built the table made the legs so sturdy that they couldn't be removed! With the legs unable to be detached, no amount of pushing and pulling was going to squeeze the big table down the stairs. Faced with this roadblock, we retreated to the living room and dropped the heavy table in the center of the floor. Knowing Mrs. Dude's was not looking for a new addition to her favorite room, I hastily came up with a new plan. I would re-sell the table! Positioning the table outside in natural light was the first step towards a great photograph. Adding the bowl full of tomatoes and sun flowers on the center of the table was the cherry on top. The flowers and fruit looked great against the table's dark wood grain. With those stylish flairs, I'd achieved the "Pottery Barn" look and instantly added value to the table! Take a look at this beautiful all wood farm table. This solid table would look right at home in the Pottery Barn catalog. Measures 48" by 35"... Not too big-not too small. Very solid with substantial legs. A few dings here or there but that gives it character. The only reason it's for sale is because I can't fit it through my stairwell! My loss is your gain ! I am not sure what it was...the flowers, tomatoes or just the whole package-but the table sold fast. The very next day, a buyer paid me the asking price of $75 dollars! That was a profit of $55 bucks in the span of 48 hours. This was the very same table that languished on CL with no takers only days before....at half the price I was asking! This table flip proves that taking time to stage and add some creativity to a listing will pay you back every time! The original seller's photo and description were so bad, she ended up settling for $20 bucks just to get rid of it! I took the time to stage some nice shots and write a winning description and earned $55 bucks for the extra effort. Be creative and you'll be rewarded! How have you done lately? Let us know in the comment section below....Dude! Photographing the table outside in natural light with that green grass background was genius and adding the flowers and bowl of tomatoes gave the photo the perfect splash of color to add interest. Great job and congrats on a nice flip Dude. You are the master! Thanks Lorraine, not bad for a "dude" right? lol! Hope you're doing well down south...love what you guys have done so far to the house you moved into. Lot of hard work, but it looks really great! Totally agree - take the time to take great pictures and your "stuff" will sell! I've looked through Craiglist one time for a headboard (which hubby ended up making me a Pottery-Barn knock-off!! :-) ) but some of the pictures were unbelievable! Unmade beds with crap all over the floor, or the family pets sitting in the middle of a pile of clothes. When people see that the item is clean, and the pictures is clear in a good setting with a good description........well, like you said.......the items will sell themselves! Fabulous Flip!! Love it! Thanks Susie- I agree. You see a lot of crummy photos post on CL. And seeing signs of a pet in a photo can automatically eliminate half your potential buyers. I sold a sofa once and half the people asked if I had cats in the house? Many folks are allergic! Glad you liked the flip, it was pretty awesome...thanks for writing in too...Dude! Dude, that was pure genius! The way you photographed the table made it look very desirable. The color combination and the clear picture gave it an inviting look. This was so telling and really makes the point that the picture can make or break a deal. I have a few items to list on CL and was planning to take a few quick pictures to get the items listed and out of my living room (I can see Mrs. Dude's point). But now I have to rethink that and focus more on staging my items. Thanks for sharing! You are definitely welcome. Let me know how you do on those photos....Dude! beckyp - In a weird way, I am glad the table didn't fit down the stairs. There's no story in that, right? Ha! Dude!!! You never cease to AMAZE me with your flippin' talents!!! Thanks Kym, I've been on a pretty good streak lately. Hopefully, I can ride it right into the Fall season....Dude! Pottery Barn sells shuffleboards, right? Free game system ....just for showing up!